ALS affects approximately 3,000 Canadians, which is almost two out of every 100,000 people age 18 and older diagnosed each year. Wondering where the ice bucket challenge really started? 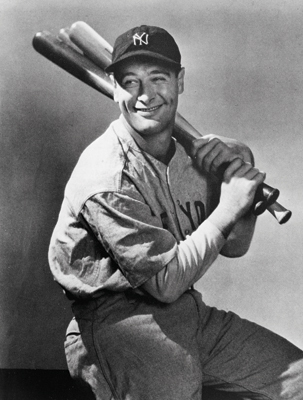 Lou Gehrig is the man behind ALS (Amyotrophic Lateral Sclerosis), also known as Lou Gehrig’s Disease. Henry Louis Gehrig was an iconic Major League Baseball (MLB) player in the 1920s and 30s. The all-star was born from a German immigrant family who came to New York shortly before giving birth to Gehrig. The family struggled with poverty, but hard-working parents allowed Gehrig to pursue sports. He enrolled in Columbia University as an engineering student. During school, Gehrig became both an exceptional baseball and football player. Scouts took notice of the player’s potential, and in 1923 Gehrig signed a $1,500 contract with the New York Yankees. This kind of money, at the time, allowed his once struggling parents to move to the suburbs. The deal also began his long, yet cut short, career in MLB. Gehrig played for the Yankees until his retirement. For 15 years, he helped the team reach six World Series games. Gehrig held the most consecutive games played in the MLB for 56 years, before Cal Ripken took the title in 1998. His total base record can only be compared and beaten by Chuck Klein and Babe Ruth, Ruth being one of his teammates while he played. Gehrig scored an average of 138.8 runs per season and became the first American League player to hit four home runs in one game. He was awarded the nickname “The Iron Horse” by his teammates because he never missed a season while playing, no matter the circumstances. He battled and overcame repeated injuries including broken thumbs, back spasms and a hand fractured in 17 places. In 1939, Gehrig’s season started to slump. He began having trouble doing simple tasks such as tying his shoelaces. That year, he was diagnosed with ALS. In May of 1939, he took himself out of the Yankees’ line-up and announced his MLB retirement. 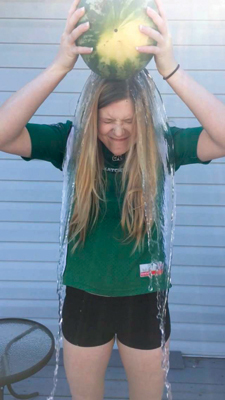 Some of the Reflector staff, including Amanda Ducheminsky (pictured) have taken on the ice bucket challenge. Stay tuned on our Facebook page for videos! Amyotrophic Lateral Sclerosis (ALS) is a progressive disease that affects motor neuron functionality in the body’s brain and spinal cord. When motor neurons die, their ability to translate information to the brain to help control muscle movements goes away. Those with ALS symptoms experience the loss of muscle movement. People in the later stages of the disease may become completely paralyzed and eventually lose the muscle capability to breathe. According to the U.S. Food and Drug Association (FDA), there is only one drug available to help treat ALS. The drug can only help reduce the severity of ALS symptoms by two to three months, classifying the disease as 100 per cent fatal. ALS often affects those between the ages of 40 to 70, and many people may also refer to it as Lou Gehrig’s Disease. Two months later, on July 4, 1939, Gehrig came back to Yankee Stadium, not for a game, but for a send off. The Baseball Almanac includes a full documentation of his speech that day. As fans cheered within a jammed packed stadium, he was said to have tears in his eyes as he spoke. Our Layout Editor, Michelle Vaniersel, also accepted the ice bucket challenge. Keep your eyes peeled on Facebook for our videos! Visit facebook.com/TheReflector.ca. Immediately after, his accomplishments were preserved in the Major League Baseball Hall of Fame. His jersey was also the first to ever be retired in baseball history. The former player then took on a civic role helping determine New York prisoner release times. During this time, his health quickly declined, and in June of 1941, Gehrig passed away at the age of 38. Gehrig helped put the spotlight on the disease, and he is the reason why many people know ALS as Lou Gehrig’s Disease. Recently, ALS has received major public attention due to a viral online challenge. The ALS Ice Bucket Challenge has helped create 1.3 million new ALS Association donors. On Aug. 24, 2014, an ALS Association press release stated that the organization received $70.2 million in donations. The challenge has contributed to a 280 per cent increase in Association funding compared to last year’s reporting period (July 29 to Aug. 24, 2015.) ALS Canada reached it $3 million dollar Ice Bucket Challenge goal, and on Aug. 23, it raised its new expected goal to $5 million, they stated in a press release. To learn more on how to participate in the Ice Bucket Challenge or how to donate to ALS Canada please visit alsa.ca. Previous story On your marks, get set, go blue!